Two ships, both of which have appeared on ClydeSights before, were seen today at Oban. 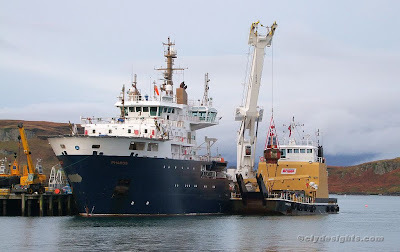 The Northern Lighthouse Board's large navaids tender PHAROS was in the process of transferring a navigation buoy to Briggs Marine's buoy maintenance vessel CAMERON. With her cargo well secured, CAMERON sailed shortly afterwards, and headed west up the Sound of Mull.